My wife and I are moving next month. As my friend says, moving is worse than getting a root canal. While I have moved in the past, I haven’t gotten a root canal. The last time we moved, we had the aid of the military movers. They were fantastic – packed everything and unpacked everything. Such services are expensive – too expensive for my wallet. Our lease expires at the end of May. The place we found was available May 1st. Obviously it’s not a very smart financial decision to pay rent in to two places – we can only live in one at a time. We were able to get the next place to give us a move-in date of the 15th. As luck has it, this gives us three weekends (including Memorial Day weekend) to move. By avoiding the dreaded same-day move, we can move much of the smaller stuff ourselves. We’ll hire movers for the furniture that we can’t carry. We’ll pay the half-month’s rent, but hope to avoid the stress of the move. We might even get movers cheaper since it won’t be the end of the month. Get Friends to Help – When you are in your 20s, your friends may help you move for beer or pizza. As you get older they may have families and other commitments that don’t make that such an attractive option any more. For instance, I can work an hour at desk job and have all the beer and pizza I want for a few days. It’s hard to justify a hard days work for a one-hour reward. Then again, and it’s obviously more about the friendship than the pizza and beer. This also comes from a pretty lazy man. Go Electronic – It’s a lot easier to move a 500GB hard drive of music than it is to move hundreds of CDs. It’s easier to move an Amazon Kindle than a pile of books (though the Kindle does have some drawbacks). My Netflix account is infinitely lighter than a DVD collection. I’m not saying these are perfect solutions, but just something to think about. Eat Down Your Food – I’ve got things in the back of my pantry that need to be eaten. How about you? Sign a Two Year Lease – It’s costly to move every year. Make sure that you at least have the option to renew if you want. Save Money with These other Ideas – Here are 72 more ideas to save money moving. Bait and Switch or “The Hostage” – Movers put the stuff in the truck and then start adding extras when your stuff is there. You have no choice – they have your stuff. They may say that your cubic feet has surpassed the estimate. Corcoran claims you can’t argue it because it’s hard to count cubic feet – she’s right. Late Delivery – Sometimes movers will group more than one person’s stuff together and your stuff is in back. She brings up that a trucking violation could delay your stuff for days as well. Don’t Give a Deposit – They have all your possessions, what else do they need? Don’t Sign a Contract with Blanks in it – A moving company can fill in those blanks and change those terms on you. Look at the Truck – If it’s in good shape the company may care about your stuff more. Don’t Sign a Skinny Contract – A one page contract is too small for a move, you want something more detailed. Don’t Pay Cash Ahead of Time – You have no proof that you paid it. I hate moving! And, unfortunately, where I live two-year contracts are pretty much nonexistent, though you do have the option to renew at the rates at that time. But, by the end of the lease I’m usually ready to leave the apartment for one reason or another. I’ve gotten extremely lucky with the place I live in now. It’s great and I’ll be renewing my lease provided I can haggle a decent price. But, I actually take exception that having friends help you move is cheaper than hiring movers. I suppose this is just my case, though, so bare with me. Every time I’ve had someone help me move, I’ve still had to rent the U-Haul truck, which means gas and mileage. I’ve started in the morning, which means I’ve also bought everyone breakfast. Depending on how many people I’ve got helping, it may be that I we go through lunch – which I’ll buy them lunch – and into dinner which is the pizza and beer. By the time it’s all said and done, I’ve spent $200+. On my last move, I hired movers for $250 and they were done in two hours. Now, they just moved the stuff, I still had to pack it. But, in my opinion that was a far better option. Still, these are good tips on saving money with the move! I’m in the process of lightening my load because I have way too many boxes every time I move. The majority of my boxes are DVDs. With a collection rapidly approaching 500, that’s a lot of boxes and a lot of stuff to carry. I like my DVDs, though. But, the scams are the most important thing to watch out for. I ask a zillion questions before I sign anything. I’ve also used the same company the last two times I’ve moved and they’ve been awesome! And, by the way, I’d rather move then have a root canal…I’ve done both. Hehe. At least with a root canal, you know that you’ll be done within hour(s). One thing to keep in mind is to not have too many people helping. If you are prepared, 4-5 people can load the truck faster than 12 people. More people means more chatting, more people tripping over each other, more opinions on how to do things, etc. 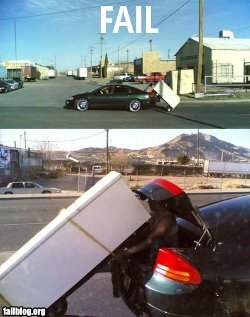 The guy stacking stuff in the truck should be a guy with some experience doing this. As a courtesy to the friends who help you move, be as prepared as possible, so they just need to load boxes. I have heard of people who still had laundry in the dryer, dishes in the sink, etc. These friends are helping you move, not acting as a maid. Another great tip on moving is to use websites that aggregate a variety of moving companies in the area and then ask for a bid. I’ve used it many times, saved a ton of money, and it has worked like a reverse auction, allowing me to throw out my moving project to the lowest bidder. Another idea would be to have a good old fashioned ‘garage sale’? Sell as many as you can in a day using a garage sale and then list the leftovers on eBay. The apartment we moved from was just down the block from our current house. We received many strange looks from the neighbors as my friends and family walked our couch and dining table down the road. It only cost me a few pizzas and cases of beer to move, quite a bargain. Getting friends and neighbors to help has saved my family a number of times in the past. It’s amazing how much quicker you can move your stuff when there are more than four hands on the job. One thing to be aware of is that there is a difference in the regulations about moving for an interstate move versus a local move. The interstate move is regulated by the federal government and we’ve got some decent legal protections there. For instance if you get a binding estimate they can’t simply over charge you and with a non-binding estimate they can charge 15% more maximum. For a local move though they are not regulated by the government in the same way so you have to be a bit more wary. Moving to a new place is troublesome. If you could just stay put where ever you are currently. Beg to differ with Barbara Corcoran on one point. She advises against using a company that puts your stuff on a truck with other moves. That’s probably good advice on a local move, but on smaller long distance moves you don’t want to pay for empty space on a truck. There are many very reputable movers who aggregate small moves to reduce cost. It means that it may take two weeks or even longer between pickup and delivery, but the price is lower. The service is fine. As always, the key is to make sure the company you contract with is experienced and reputable. Check DOT and BBB. You can ask for references too. If they balk, you walk. I don’t understand why people get a kick out of scaming people. I had a bad experience moving in the past but recently i purchased a new home and needed to move again here comes the nightmare. But after searching for a good moving solution i found a company by the name of Packing Service Inc or http://www.packingserviceinc.com they sent a rep to my home he gave me a quote and that weekend was ready to help me pack and get ready for my move. They also gave me a site i could go on about moving scams at http://www.movingscam.info very very helpful the information on the site saved me a lot of money and time. If you want to save money, paying for empty space on a truck is not the way to do it. When you contract a reputable moving company you can trust that your items will be handled correctly and your small move will take place with no problems. Think of it as when you “check” your luggage when you are flying. The space needs to be filled in order to provide the best price. Everyone gets their things and everyone is happy.